Konrad Antoni Muchowski was born on 3rd July 1918 in Koscierzyna, Poland. He trained at the School of Gliding in Ustjanowa then went on to serve as a pilot in the Polish Air Force. His service after the German attack in September 1939 is currently undocumented though he is recorded as flying with 42 Squadron in the reconnaisance role and completing a sortie in a PZL P-23B where his observer was killed. Again the circumstances of his escape from Poland and passage to the UK are currrently unknown. 501 Squadron – Muchowski was inducted into the RAF as a Sergeant and posted to 5 OTU Aston Down on 19th August 1940. He joined 85 Squadron at Castle Camps on 10th September and moved to 501 Squadron at Kenley on 23rd October. 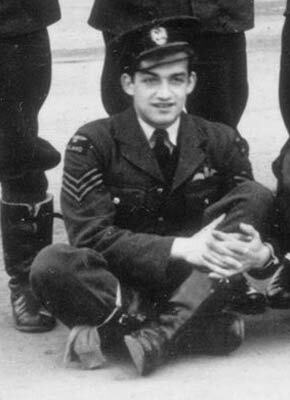 Muchowski was posted to 308 Squadron at Baginton on 9th March 1941. He was rested on 25th June and went to CGS Warmwell as a staff pilot. On 22nd July 1942 Muchowski was sent to 4 FIS for an instructors course and then went to 25 EFTS Hucknall on 23rd October. He was then posted to 16 FTS Newton and was there until his release from the Polish Air Force in November 1946 as a Flight Lieutenant. He had married Eleanor S Hellawell in Huddersfield in June that year. His postwar life is also undocumented, however an award of the MBE was gazetted (15th May 1956) to a person of that name as a Driver (Public Services) on 5th March 1956. He was definitely one of the Polish airmen who helped form the air force of Pakistan after 1947, although he may have settled there for some time his death was recorded as being in Huddersfield on 4th May 1988.